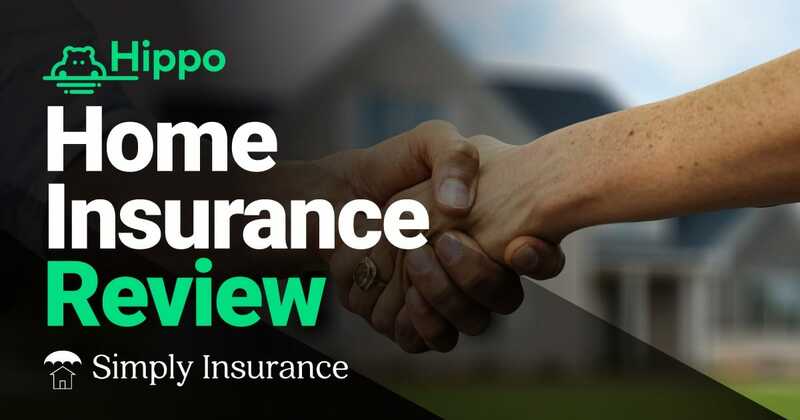 Summary: Hippo is hands-down, the best way to buy homeowners insurance online and avoid the traditional 3 to 5 day home insurance application process. However, the website doesn't do a great job explaining how the claims process will work and right now Hippo is only offered in a few states. This is why I put this ​Hippo Insurance Review together. To go over all of the additional coverage options that are included with your policy, and to help you see how simple and fast they make it for you to apply online for homeowners insurance and get immediate coverage. What Does Hippo Homeowners Insurance Cover? What Does Hippo Not Cover? How Much Does Hippo Coverage Cost? ​When it's time to buy a home, the one thing most of us are unaware of and unprepared for is the idea of needing homeowners insurance to close on a home. According to a recent study conducted by Hippo. 70% of people do absolutely no research before they buy home insurance, and 73% miscalculated how much coverage they needed. Does this mean that 73% of homes aren't ​correctly insured with their current homeowners insurance? According to the Insurance Information Institute, a poll conducted by ORC International found that 95 percent of homeowners had homeowners insurance but only 41 percent of renters had renters insurance. I don't want to assume anything, but if you purchase anything without researching it, how can you possibly know what you purchased? In this review today I am going to show you how their process works, and why it's the best way to buy homeowners insurance. It can save you both time and money when you get home insurance quotes and buy online. ​image sourced from hippo infographic, see full infographic here. Hippo is what I like to call a NewTech Insurance Company. A NewTech Insurance Company is an insurance company that creates a new buying process for their industry and sets a new standard; this is exactly what they are doing. This company was built by a mixture of Technology Titans and Insurance Giants who have come together to create a solid product and an excellent process. They are backed by TOPA Insurance. If something were to happen to them, your policies would still be perfectly fine. TOPA Insurance has an A- (Excellent) rating from A.M. Best. 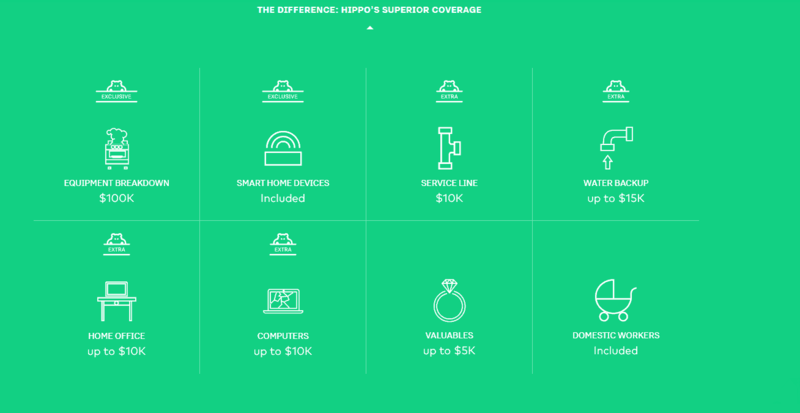 What makes Hippo so different is that they are changing the way homeowners insurance is purchased, and what benefits should come standard on the average homeowners insurance policy. ​Hippo Insurance is introducing a much easier, faster and seamless process by having a 100% online process. You can get quotes within 60 seconds and apply online in minutes, and because everything is web based, on average, their premiums are coming in at around 25% cheaper than other companies. As I stated above, they are offering a more modern coverage by adding things like home electronics and smart appliances to their plans. They also offer enhanced coverage for home offices and coverage for things like water backflow and service lines. ​​Image sourced from hippo infographic, see full infographic here. 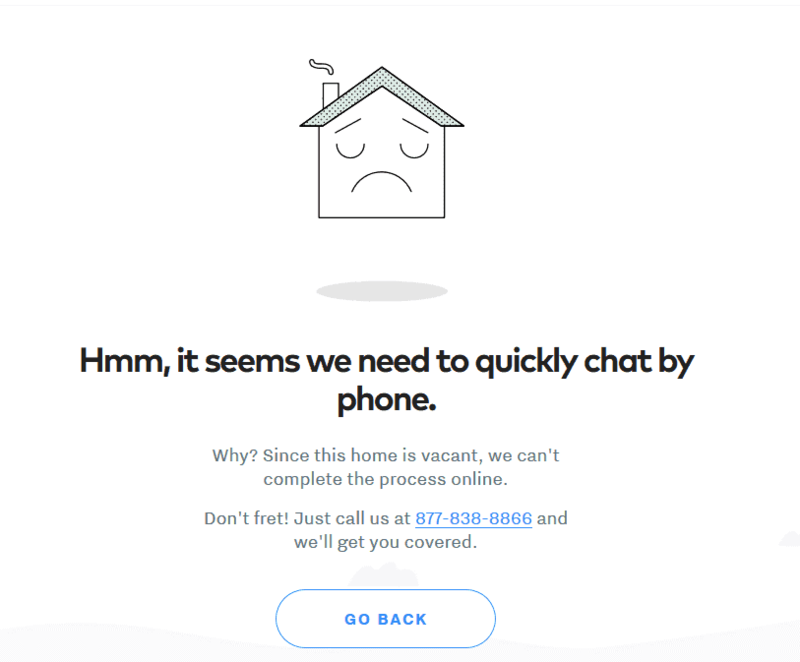 ​Hippo is also going a step further by focusing on preventative measures when it comes to homeowners insurance by doing things like offering a free water leak sensor with every policy and will be adding new features in the near future. We talk more about this water leak sensor below, its really a great device and adds an awesome value to their home insurance policy. Your Hippo Condo Insurance quote can still be completed in about 30 to 60 seconds and have the policy finalized within 4 minutes. 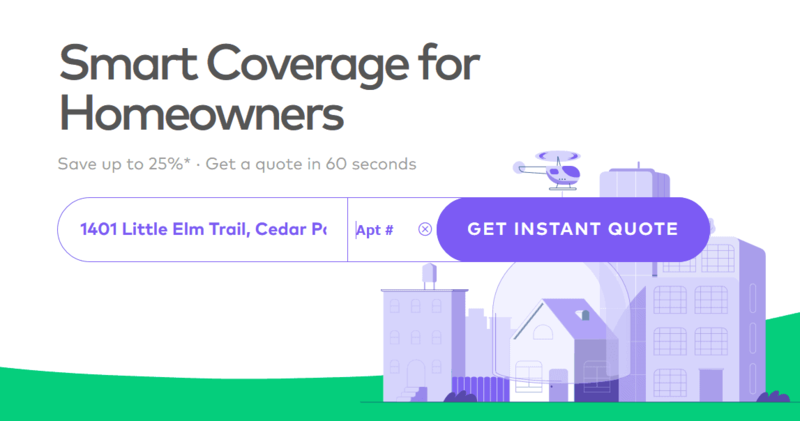 This is awesome for anyone who wants to insure multiple homes with them or for anyone who wants the same great product and speed for their condo. Some special benefits about their condo insurance is that it is available for condo owners and condos rented to others. You can add up to $15,000 for water backup coverage. $5,000 for Computer coverage and Home Office coverage come standard on the policy and can be increased. ​This policy also has Equipment/Appliance Breakdown coverage ​for a primary condo or a condo rented to others. ​There aren't any major difference except for things like Loss Assessment Coverage, this will cover you in the event of a loss in a common area of your condo. If the clubhouse burns down, the condo will split the cost to everyone in the condominium. Loss Assessment Coverage would cover the portion that you owe so that you don't have to pay out of pocket for the ​expense. 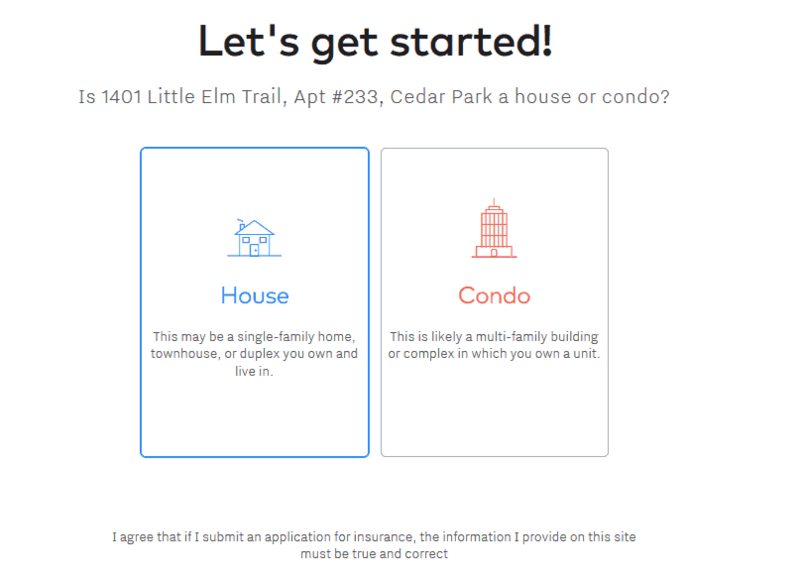 ​The Condo and Homeowners quotes run on the same software, just put in your condo's address and you will notice a small pop-up asking for Apt#, this is the same as your Unit #. ​The next step will be choosing the condo option for your condo. 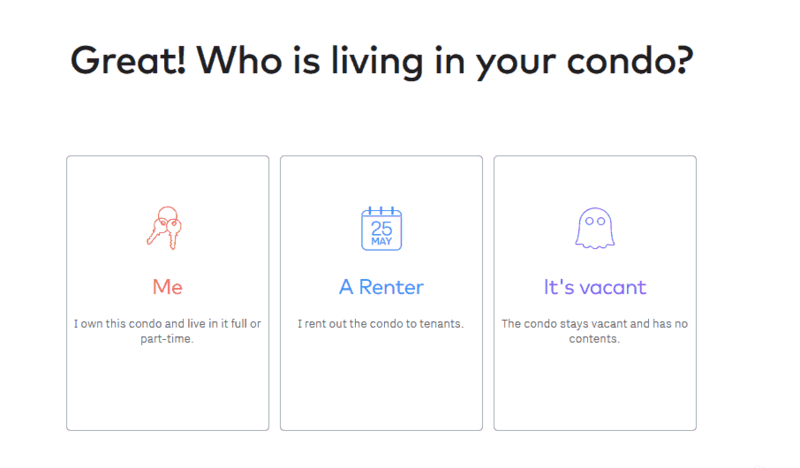 ​Once you choose the condo option you will be taken to the screen asking if the condo is empty, being rented out by you, or if you are the owner of the condo. ​After this section, obtaining coverage for your condo is the same as it is if you were purchasing home insurance. ​Overall, the process for purchasing condo insurance through Hippo should be the same as purchasing ​their homeowners insurance policy. Depreciated Value (DV) - Depending on the type of plan you choose, If something in your plan - like your roof or a personal belonging - is insured for its Depreciated Value, any claims will be calculated by determining how much you originally paid for that item, how long you’ve owned it, and how much the item is worth today as a result of depreciation. Replacement Cost (RC) -​ When something in your plan is insured for its Replacement Cost, a covered claim would be reimbursed for the cost of replacing that item as of today, ​minus your policy deductible. Insurance for Roof Repairs - In the event of damage, your roof may either be insured for its Depreciated Value (based on its age) or its Replacement Cost (the cost of repairing or replacing it today). This valuation type is automatically determined based on the roof’s age and materials. This is the ​coverage that will cover some of your personal property both inside and in certain instances, outside of your home. The amount of coverage paid out may vary depending on type of item, location of item (in vs. out of home) and the specific type of peril. Hippo’s ​Our Best Value and ​Expanded Protection plans provide Replacement Cost Coverage, which pays you what it would cost to purchase similar new items at current retail prices. ​The Essentials plan from Hippo provides Actual Cash Value coverage, meaning, the depreciated value of your possessions at the time of the loss (not when you bought them). This is the insurance that covers certain instances of bodily injury, personal injury (emotional or other non-physical damages), medical expenses, and property damage sustained by others for which you or your family members are legally responsible. Jewelry & Watches - ​​Covers for loss by theft of Jewelry, Watches, Furs, Precious and Semi-Precious Stones, coverage amount depends on the type of policy you purchase. Equipment Breakdown - Covers the cost of repair or replacement for pretty much everything in your home that uses electric power, in the event of electrical or mechanical breakdown. ​The Equipment breakdown coverage protects up to $100,000 and the deductible is only $500, which is less than the standard deductible for other types of claims. 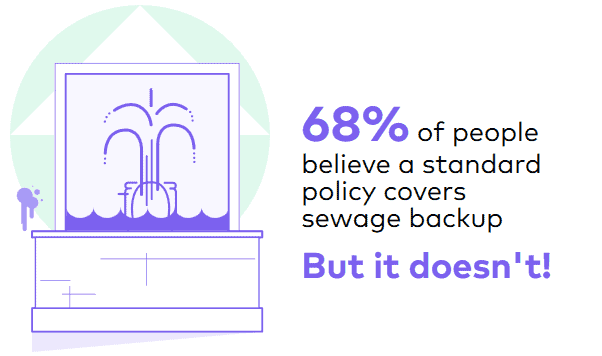 Extra Water Backup - This doubles your standard water backup protection, covering up to $15,000 for damages caused by backup and overflow of water (Included in Hippo’s Extended Protection plan). Mortgage Payment Protection - In the event that your home becomes uninhabitable, this coverage provides up to $1,500 a month, for up to 12 months, toward your mortgage payments (This coverage is included in Hippo’s ​Our Best Value and ​Extended Protection plans). Extra Jewelry & Watches - Increases coverage up from $2,000 to $5,000 for loss by theft of Jewelry, Watches, Furs, Precious and Semi-Precious Stones (Included in Hippo’s ​Extended Protection plan). Your policy is going to have 3 different deductibles, this is the amount of money you will need to pay for an eligible claim before Hippo starts to pay. Applies to eligible claims that are not a direct result of wind, hail or a named hurricane. Also known as "All Peril Deductible". Applies to eligible claims that are the direct result of wind or hail damage. Applies to eligible claims that are the direct result of a named hurricane at the time the loss occurred. Keep in mind that all of the above deductibles will have a different amount so be sure to remember what amount you will need to cover based on how the loss occurred. ​If Hippo insures your primary residence, ​they can also insure your secondary or vacation home. This is awesome if you are renting out a condo you are still covered. ​​The devil really is in the details when it comes to homeowners insurance, and Hippo Insurance has made it much simpler with its 3 different policy options. ​Anything is better than nothing when it comes to insurance, so at the least, buy what you can afford. The Essentials plan is just that, all of the essentials, Hippo shows that around 35% of people usually purchase this plan. This plan will have the highest deductibles, and most of the benefits will cover only the actual current value of an item when it's lost, not how much it costs to replace it. It will also have lower coverage amounts for most of the benefits including things like liability and medical. This is the only plan out of the 3 that Does Not have mortgage payment protection. 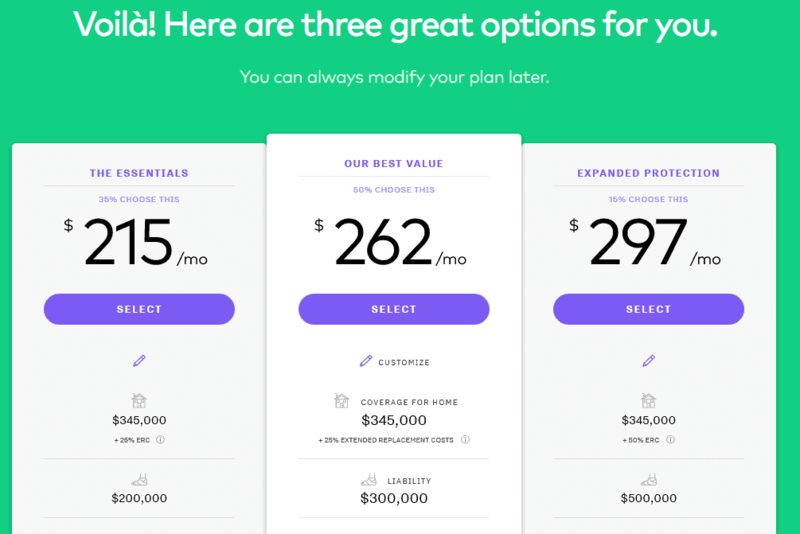 The Our Best Value plan is going to give you the best of both worlds in terms of coverage and premium, Hippo shows that around 50% of people usually purchase this plan. This plan is going to include all of the benefits of "The Essentials" plan but give you more benefits for all of your coverage options like Liability and Medical. You are also going to see lower deductibles for this plan. With this plan your personal property is covered for Replacement Cost, this means if you have a loss, Hippo will cover what it will cost to replace the item, not what it's current value is. The Expanded Protection plan is going to ​be the most expensive option, but has the most coverage available. Hippo shows that only around 15% of people usually purchase this plan. This plan is going to include all of the benefits of "The Essentials" plan and the maximum amount of benefits for all of your coverage options and the lowest deductibles​. ​Your benefits are also covered for Replacement Cost, this means if you have a loss, Hippo will cover what it will cost to replace the item, not what it's current value is. ​When you are going through the application process, Hippo has a live chat area for you to ask any questions that you may have. The representative that I chatted with was very knowledgeable and can answer any state specific questions. You also should be mindful of what things will be covered by other types of insurance like car insurance, life insurance, travel insurance or health insurance because if your home insurance companies wont cover it, the others might. ​You are already saving money if you get a policy through Hippo. These sensors cost $50.00 each and will be yours for free when you purchase your policy. Just another awesome benefit that almost no other company is offering. 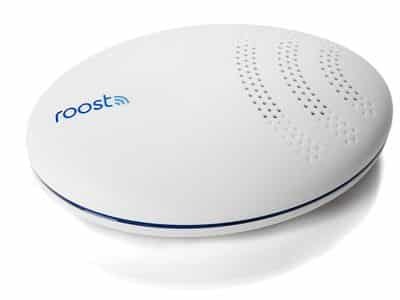 According to Roost, you can outsmart water with their smart water leak and freeze detector. ​If it ​senses a water leak, it sends alerts to your smartphone. This is a great product for your home or smart home, even if you don't get your homeowners through Hippo, you can read all about the product here in even more detail. ​The main driver of your premium is the cost it would take to rebuild your home in case of a disaster. This is ​based on the materials used to build your home, number of rooms, number of stories, and many other factors. The location of your home and your personal history with home or renters insurance claims are also taken into account. Hippo has made it very easy to compare quotes and review insurance rates online. The best way to find out your cost is to get a few quick and free homeowners insurance quotes below. ​Hippo does not cover properties outside of the U.S.
Hippo Insurance is currently not available Nationwide but the list is growing fast. Hippo Customers can add payments to their loan, pay via a checking or savings account or pay with a debit or credit card. Hippo provides a dedicated claims advocate to all of their customers when they submit a claim. ​The advocate will with you to manage your claim related needs and ensure you obtain the best and most effective resolution as quickly as possible. They will ​help you with communications with adjusters, service providers and even help book hotels or transportation if necessary. You have to call in to submit a claim, but hopefully they will add the ability to submit a claim online or via your cell phone in the near future. There really isn't much information about exactly how the Hippo Claims process works just yet. To submit a claim, ​you can call 1-800-886-0318. ​No other ​Hippo Insurance Reviews are as long as mine; however, I wanted to make sure that I gave you as much detail as possible. If you have been holding off on buying ​homeowners insurance for any reason, I say give ​Hippo a shot. This is hands down the best insurance review I’ve ever read. Great job, JC! Thanks so much Bill, I really appreciate it. This post was longer than I thought it would be. I cannot believe i saved $400 on homeowners insurance. I am so glad i didn’t give up on my search! I am super happy you were able to save so much on your homeowners. I am glad this review helped you.